The SBS-3 is a receiver for the Mode-S/ADS-B beacon of aircraft on 1090MHz. The beacon usually transmits data like position, height, identification and other information of the aircraft. With the supplied software this data is presented graphically and in tabular form on a computer and allows to display the current air situation in the region. The distance up to which an airplane can be receive is theoretically up to 400km, but is practically limited by local surroundings, antenna and antenna position. The SBS-3 further offers two independant receivers für the VHF/UHF airband. The receivers are directly controlled from the supplied software and cover a frequency range from 27 to 980MHz. Two frequencies can be monitored at the same time. These receives have an own, commen antenna connector (SMA female). A small wire aerial is included. Decoding of the received audio signal is done directly in the SBS-3, the audio is transmitted over the built-in Ethernet connection. This allows remote operation completely independant of a computer. Planned software extensions for the SBS-3 is a receiver for the AIS beacons of ships. These beacons transmit identification, position, direction and speed. AIS is used for traffic control and navigation of naval traffic. The software is still under development and will be available later in 2012, free of charge to SBS-3 owners. New Since May 2012 a new software (beta version) is available in the manufacturers download section. This new software extends the capabilities of the flexible SBS-3 SDR receiver to receive and decode ACARS transmissions. This is possible in parallel to the ADS-B reception at the same time. Note: To receive an ACARS signal on VHF a proper antenna is required! Possible antennas are the KE-137, the TA-1 sat dipole, a Discone or similiar antenna. Power supply of the SBS-3 is done over the USB connection, a cable is included. The data of received aircraft etc. is only sent over the Ethernet connection, not over USB! The antenna connection for the 1090MHz signal is a SMA female socket, a small magnet base antenna is included in shipment. Other antennas suitable for 1090MHz can be used as well and can improve the reception range. WiMo offers an antenna specially designed for 1090MHz, see below. 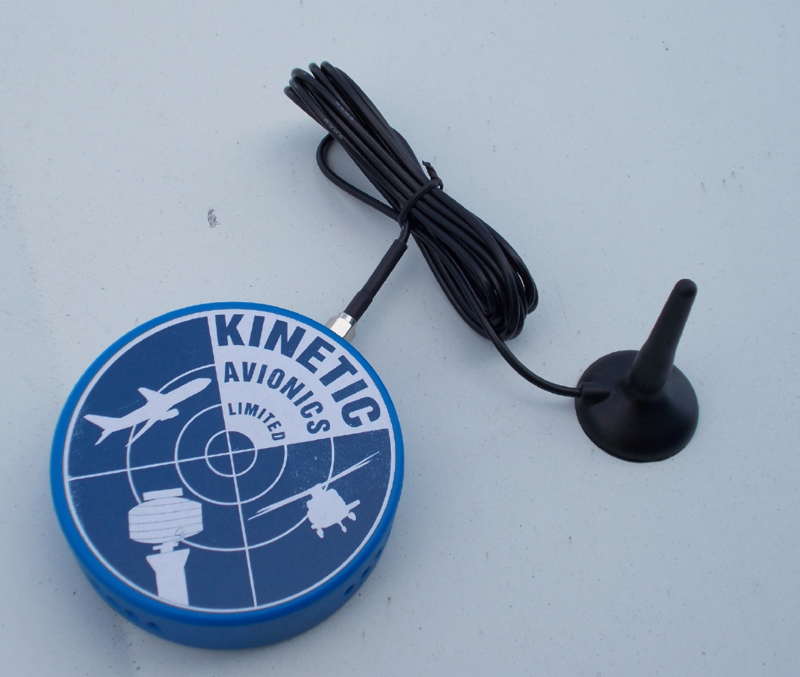 The supplied magnet base antenna works best when mounted on a metal surface. The received data is displayed in tabular and graphical format. The table shows identification, nationality, callsign, position, ground speed, heading, rate of ascend/descend etc. The graphical map displays the position and tracks of aircraft together with selected data for each a/c. Descents/Ascents are coloured differently, representing an up to date situation of the regional airspace. Various zoom levels allow detailed display of smaller regions, e.g. a nearby airport. An elevation view shows the vertical movements of tracked a/c. The map also displays country boundaries and coastlines as well as waypoints, cities, airports etc. The these waypoints are stored in a simple text file format and can be easily extended. The 1090-PUCK is an ADS/B receiver which is focussed on the real task at hand - receibe 1090MHz secondary radar signals well and nothing else. This allows a much more affordable construction of the receiver in comparision to it's larger companion 'SBS-3'. nevertheless the 1090-PUCK offers excellent receive capabilities, usually much better and more reliable as with cheap SDR USB sticks. The 1090-PUCK is operated with the same well known 'basestation' software. The benefit of this software is the clear interface design and easy extensibility. The connection to the computer is done via USB, which also handles the power supply. For teh antenna connection an SMA socket is provided. Due to the small size (92 × 25mm) and low weight (300g) the 1090-PUCK is ideal for portable operations and for use during a vacation. GP-1090 Antenna, suitable cables and pre amplifier, complete antenna kits.